Is anyone else tired of looking at their computer screen after Cyber Monday?? I decided to avoid all the crowds and craziness this past weekend and just do my best to get some good deals online yesterday. But boy, my credit card is aching! I realized that now that my holiday shopping is done (yay! ), I am going to need to be on a stricter budget for the rest of the year. 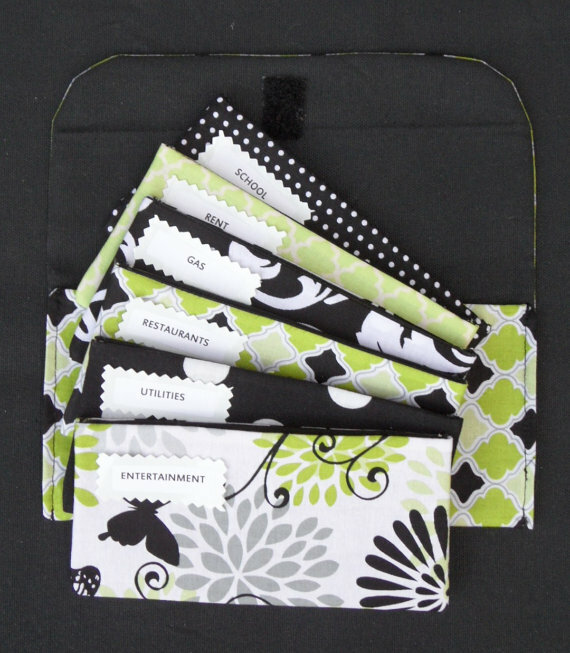 That's when I saw these adorable pouches on etsy! 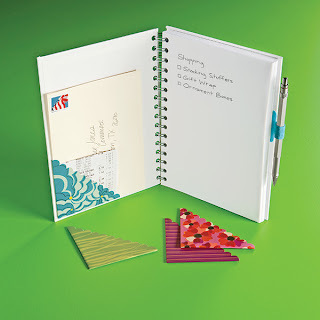 Instead of using plain paper envelopes to keep track of your cash, you can have these pretty ones instead. 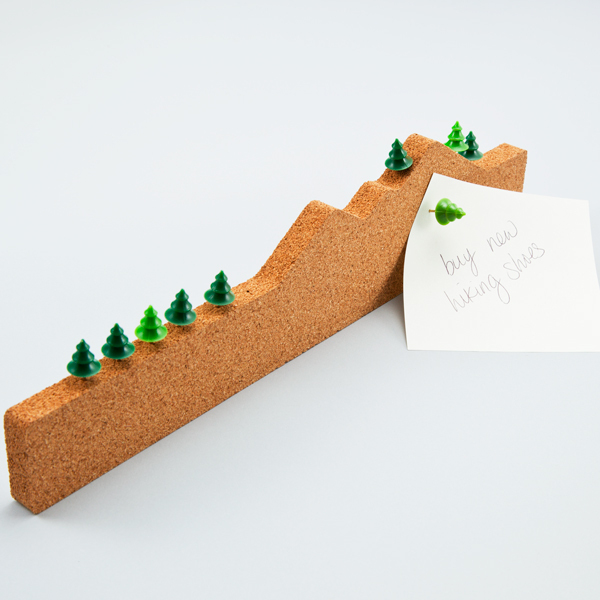 Now, I get it that you are buying MORE things just to budget, but at least these will last you many many holiday seasons. What are you doing to budget yourself this year? So, how was your big FEAST this past week? We had a great time cooking some of our favorite dishes, spending time with family and friends, and just lying around on the couch as we tried to digest all that yummy food. MUCH better than getting a frozen one. and thought it was genius! What is going to be on your list?? This morning I woke up feeling so much gratitude. My amazing fiance who gives me undying support and encouragement every single day. 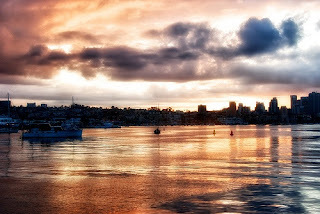 Our beautiful home- and this gorgeous city! Lovely clients who open up their homes and trust me to help them sift through their stuff. The most adorable nieces in the world who continue to amaze me with their wit and unconditional love. And our newest little nephew who makes the best faces! And this week, I am grateful for a "normal" turkey instead of the poor amputee that we had two years ago... we certainly learned our lesson when we after we tried to have Thanksgiving in January (Why not?!) and there were NO turkeys anywhere! Last but not least, I am grateful to YOU, my readers who indulge me in talking about my nerdy hobbies and organizing obsessions. Two of my closest friends had their birthdays this weekend. I am usually very prepared with lots of birthday cards to choose from- as you could guess, I have a box of greeting cards ready to go for any occasion. But this time, I just didn't have the right cards for these sweet guys. I just wasn't as prepared as I thought I would be. There are certainly worse problems than having to go to the store to pick out birthday cards. I'm always the weird gal laughing by myself in the card aisle. 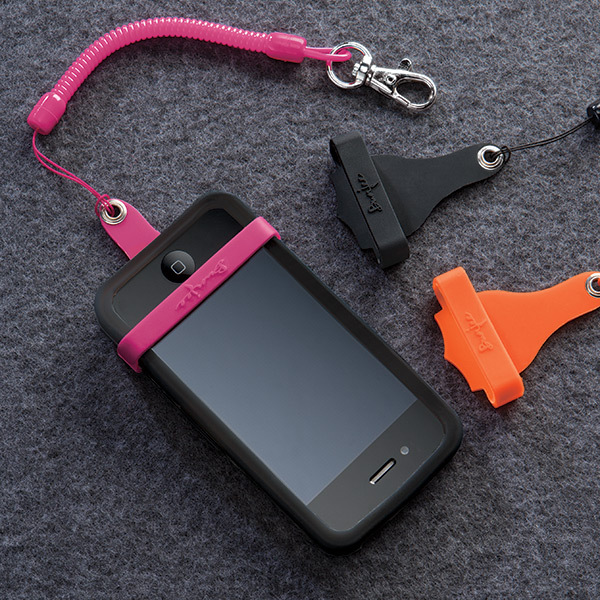 Maybe you don't always have to be so prepared. If it means I get the chance to laugh in the middle of the day, then I'll take it! Isn't this Button Box adorable?! What a cute way to store all the little necessities needed to sew back on that loose button. So cute! Well, it could be yours for 25% off! See Jane Work has lots of new products on their website and they are offering this great discount ONLY TODAY. Just type in NEWSTUFF11 during checkout. See all of their new stuff here. This Memo Mountain just cracks me up! 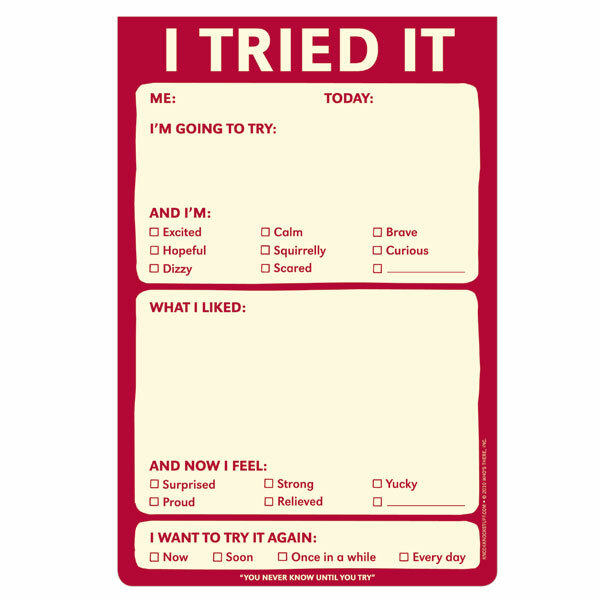 And how silly is this memo pad! 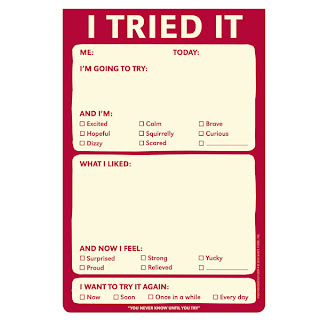 What a great motivator to try new things. Perfect for kids AND adults. Love it. 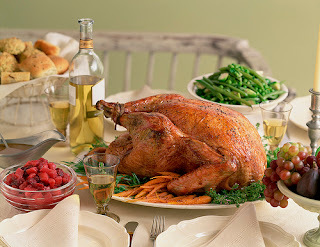 Has anyone started planning their Thanksgiving meal? For the most part, we are just dreaming about all the delicious food we are going to EAT. But we have also started making lists for the grocery store and looking up recipes. 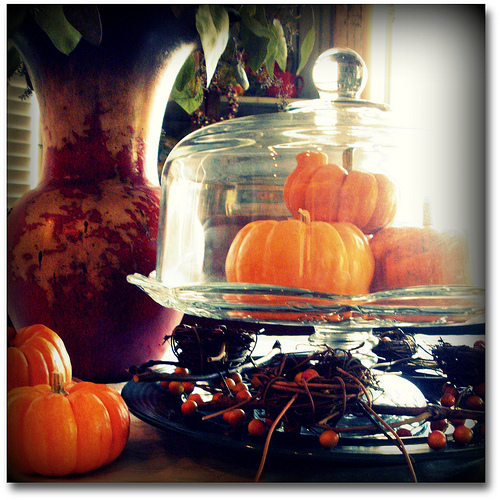 And then there's planning the decor... what fun, new things can we do for our table this year? But anyone who knows me won't be surprised to hear that I'm mostly thinking about dessert! 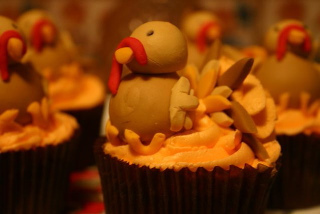 How cute are these turkey cupcakes?! What are YOU doing to prepare for next week? This arrived in the mail. Jeesh! How am I supposed to resist that place when there are adorable and fun organizing products like this, just beckoning me to drive over there and buy them all?! I mean, seriously? Are these for real?? So perfect for my new notebook! I MUST have this! I can't be the only person who loses her phone in her big purse, right? So, should I give in to temptation and go back to that lovely and amazing store? Or should I just sit at home and pine over all the incredible things that I'm trying to resist?? my dearest cousin is like my big sister. 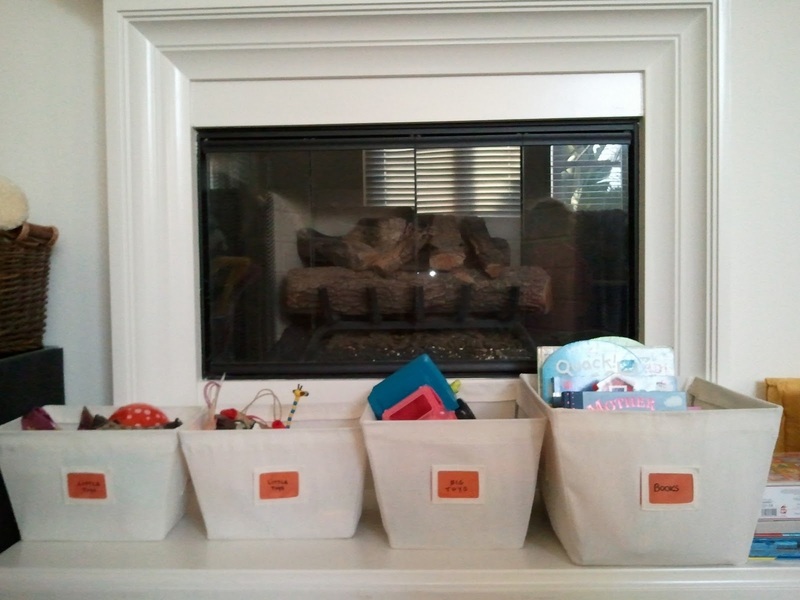 To keep her adorable daughter's toys in order, Lindsay uses canvas bins from The Container Store. 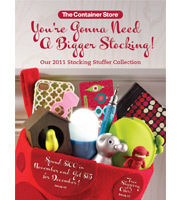 The various sizes are perfect for small toys, books, and stuffed animals. She swapped out the labels for a fun color that matched her living room decor. And now my little baby cuz is learning to put her own toys away! Organizing skills starting early... I'm so proud! And just for fun, here we are during a fun celebration for our grandparents' anniversary (circa 1991??). 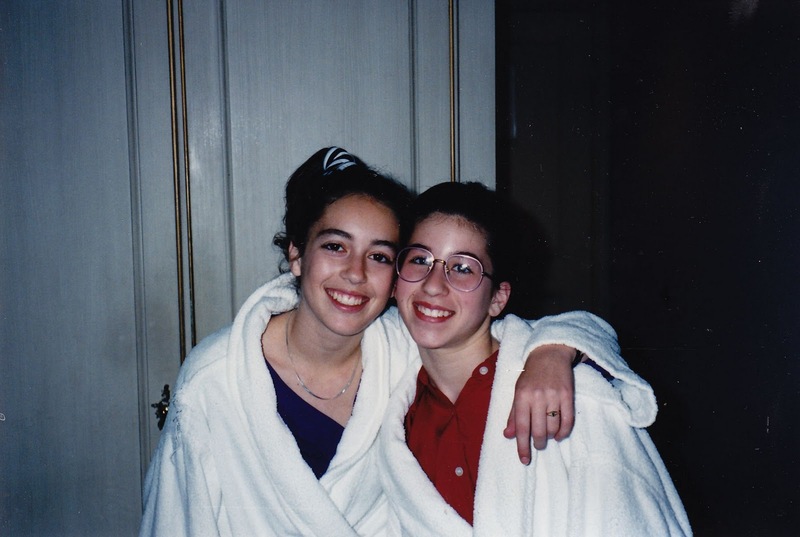 I'm lovin' the HUGE glasses and the scrunchie. Sorry, Linds, I had to do it. Love ya! My Organized Friends- Day 3! and loves Anthropologie just as much as I do. The first thing I noticed when I walked into Amanda's apartment in South Park three years ago was that her bookcase was color-coordinated! Not only had she grouped her books together by color, but she also added matching tchotchkes and souvenirs from her travels. It is as if each shelf tells a story of her life and her experiences... and the books look so much more organized than if they were just placed randomly. She and her husband throw pretty fun parties ("Guac-Off" anyone??) and I'm not the only one who ends up gazing at their bookshelf to see all the cool stuff they have collected. But maybe I should learn to mingle more and do a little less snooping! Welcome to day two of my organized friends! The sweet and oh-so talented photographer I met at my best friend's wedding. She captures the most precious moments between newlyweds, silly kiddos, and loving dogs. The first time I saw these photos of her new studio I almost fell over! Not only are the photos gorgeous (of course! ), but the whole space was so beautifully decorated and organized. 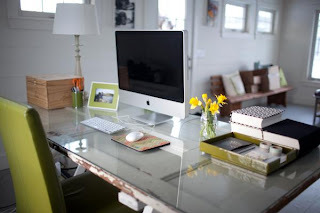 Take a look at her desk... made out of an old door and a piece of glass, this funky desk is a perfect focal point for her studio and a great spot for her to get her work done. 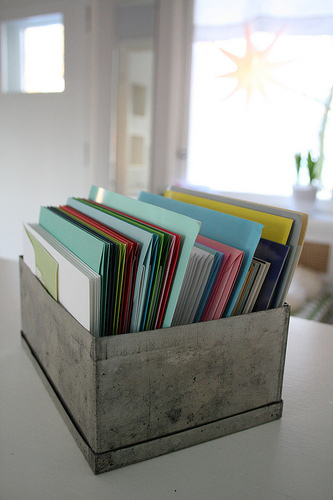 Meredith also utilizes a letter tray to corral loose or small items on the desk. Keeping her desk clean and tidy is not only important for running her business, but it also helps to give a great first impression to new clients. I can't wait until January when I get to visit Maine for the first time. I hope that we can stop by Meredith's place so I can see her studio in person. check out this cool video HERE. Today kicks off a full week featuring my organized friends! I'm so excited to share some of their photos with you. 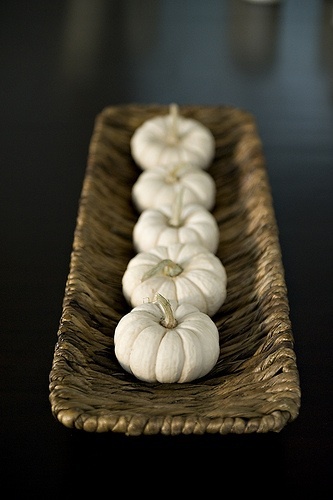 Each one has their own style and loves feeling organized, just as much as I do. My fun-loving, adorable friend who is always up for a trip to West Elm or to World Market. 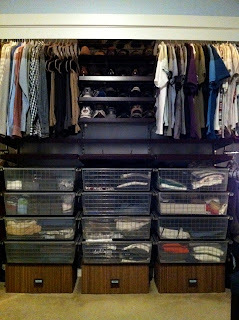 Look at how amazing his hall closet looks when all of his miscellaneous household items are contained in these clear bins! 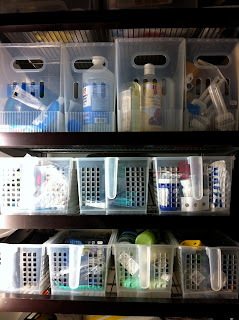 The handles make it easy to pull out the baskets and the clear containers are great for visibility. All from The Container Store. 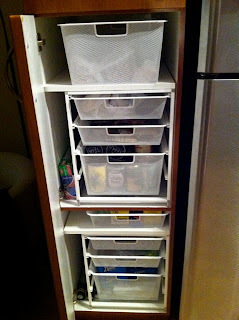 Here is his organized pantry where he uses elfa drawer units (again, the Container Store) to keep his yummy snacks and ingredients in place. 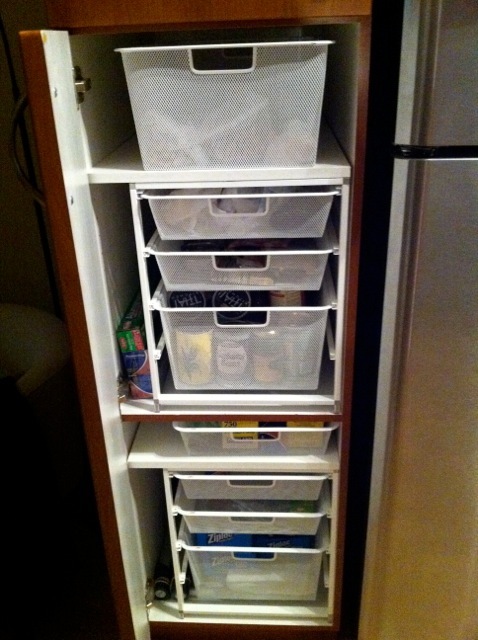 The drawers are great for those deep cabinets! 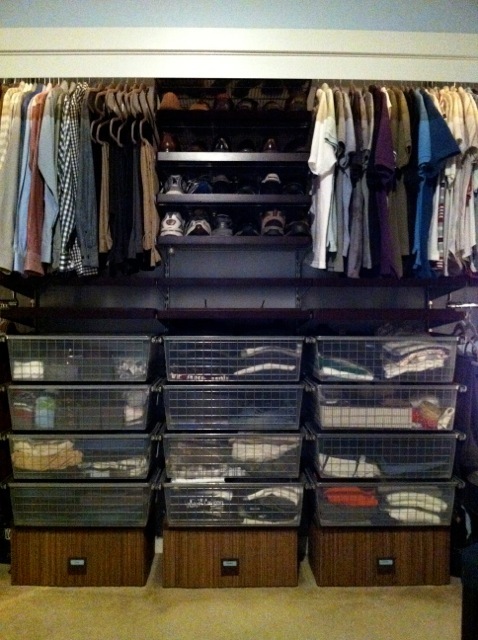 And last but not least, his incredible closet! Seriously, his closet is a part of his home tour when new people come over. He even took the doors off!! And I can bet you that it looks this amazing any time of the day. Inspiring or what?! Thank you, Ryan, for letting us into your beautiful home. By the way, did you see the new West Elm catalog?? SWOON! 2. 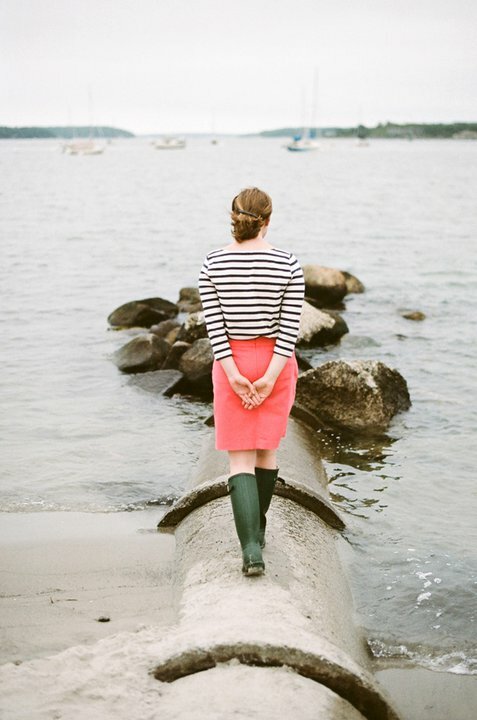 Update my wedding planning binder; check some things off our to-do list! 4. Look up some recipes for my slow cooker- I've been craving yummy stew! 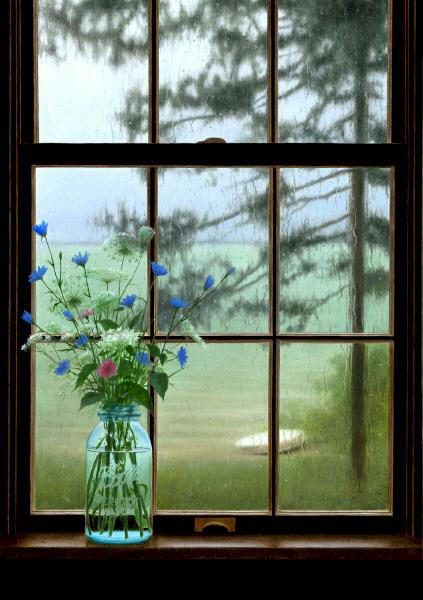 So, what do you like to do on a rainy day? 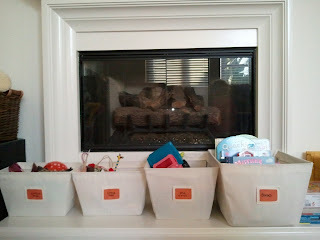 **Stay tuned for some fun posts next week featuring my organized friends. They are truly inspiring! I have been eating WAY too much candy this week. 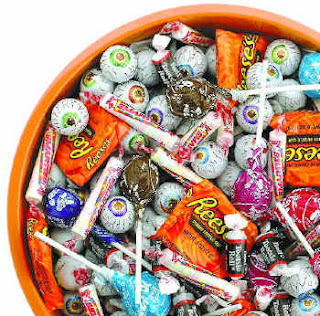 This sugar rush was fun on Halloween when I kept running back and forth between the living room and the front door to hand out candy (the kids were SO cute!). But ever since Monday, I have been feeling that slump that comes when you start crashing from the sugary high. I have done my best to keep myself motivated, but it's been extra tricky this week. The only time I felt energized was when I decided to tackle the bin my lovely fiance has been filling with odds and ends. Now that was FUN!!! Let's hope the chocolate runs out soon.